The Bras d'Or Lakes in Cape Breton, Nova Scotia are well used in the summer months for many water activities and the marina in the town of Baddeck is the ideal location to moor your boat. A yacht club lines the shoreline, so the berths at the marina are big enough to dock larger sized yachts while tourists enjoy the beauty of the town of Baddeck. 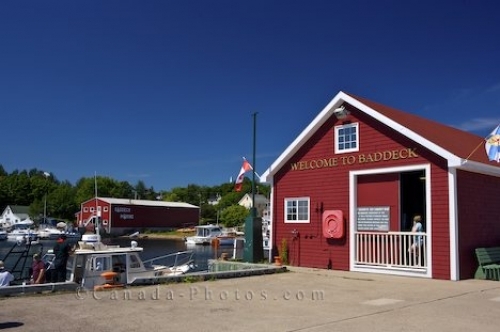 Marina in the town of Baddeck at the start of the Cabot Trail, Bras d'Or Lakes, Cape Breton, Nova Scotia, Canada. Picture of buildings and boats at the marina in the town of Baddeck at the start of the Cabot Trail in Cape Breton, Nova Scotia.